Team Suzuki Press Office – September 30. 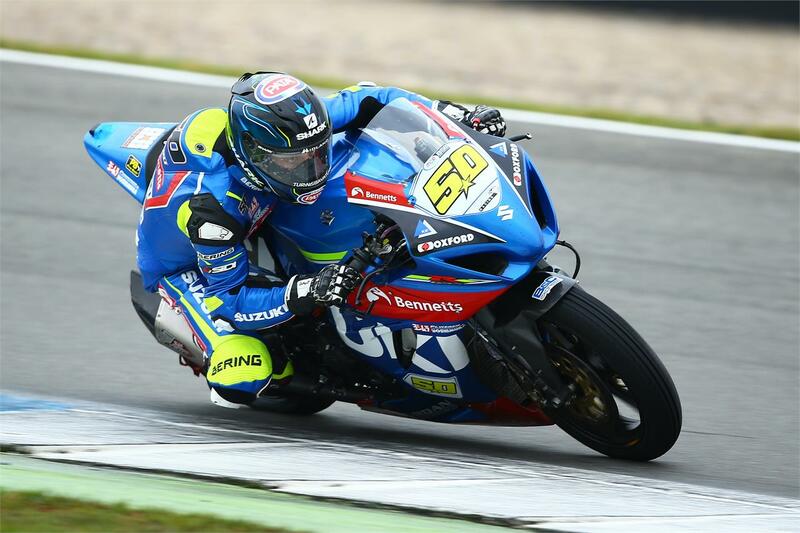 Bennetts Suzuki’s Sylvain Guintoli will start on the third row of the grid for tomorrow’s opening race at Assen, after qualifying with the eighth fastest time at round 11 of the MCE British Superbike Championship. Guintoli had been consistently-fast all weekend, but with the rain coming in for qualifying, the former World Superbike Champion was still able to progress through Q1 and Q2 to the final session, where he managed the eighth-fastest time in tricky conditions. Richard Cooper, making a wildcard appearance in the Superbike class this weekend, had also been fast in practice, posting the sixth fastest time in this morning’s FP3, as the team made progress with his setup every time he took to the track. He progressed from Q1 but crashed in the closing stages of the session. He was able to take to the track for Q2, but unfortunately crashed again. He remounted to set the 14th fastest time of the session, but was disqualified for not returning to the pits and will start 18th. Taylor Mackenzie had spent much of practice getting comfortable on his GSX-R1000, as he looked to continue his recovery from a broken foot. Unfortunately, he also crashed in the difficult conditions, taking a nasty blow to the head, and has been declared unfit for tomorrow’s two races. Qualifying result: 1. James Ellison, 2. Leon Haslam, Christian Iddon, 8. Sylvain Guintoli (Bennetts Suzuki GSX-R1000), 18. Richard Cooper (Bennetts Suzuki GSX-R1000), 22. Taylor Mackenzie (Bennetts Suzuki GSX-R1000).